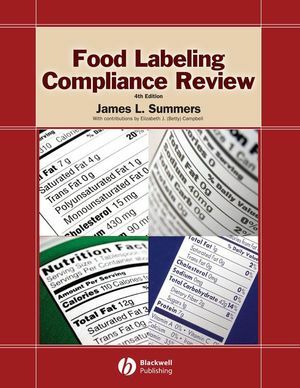 Consultant and long-time Food and Drug Administration (FDA) food labeling expert James Summers answers the many questions surrounding FDA food labeling regulations and compliance in Food Labeling Compliance Review. This comprehensive manual and fully searchable, accompanying CD-ROM are designed to aid in understanding the requirements of the FDA. Food Labeling Compliance Review is a must-have for regulatory officials, industry personnel, and others responsible for assuring that the label and labeling of domestic and imported food products in interstate commerce comply with the requirements of the Federal Food, Drug and Cosmetic Act, as amended. The new fourth edition of Food Labeling Compliance Review fully covers recently enacted provisions requiring labeling for allergens, trans fats, and qualified health claims. Clearly illustrated with dozens of charts, sample label panels and 'Nutrition Facts' boxes, Food Labeling Compliance Review is the practical, no-nonsense tool needed by both the experienced and inexperienced food label reviewer. Author: James L. Summers is Senior Consultant with EAS Consulting Group, LLC (Alexandria, VA), a leading provider of regulatory services to the food, dietary supplement, and cosmetic industries. He is a former FDA food labeling expert with 32 years tenure at FDA. He has held positions as Aquatic Sampling Specialist, Supervisory Microbiologist, Public Health Sanitarian, General Biologist, FDA Inspector, Regional Shellfish Specialist, and Consumer Safety Officer (Division of Regulatory Guidance). His most recent positions with the FDA were as Supervisory Consumer Safety Officer, Branch Chief, and Senior Consumer Safety Officer in the Office of Food Labeling, where he handled the most controversial, complex, and precedent-setting problems involving regulatory compliance issues dealing with food labeling. He participated in the development of policies and regulatory strategies regarding the enforcement of NLEA and other food labeling regulations. Contributor: Elizabeth J. (Betty) Campbell now serves as Vice President of EAS Consulting Group, LLC (Alexandria, VA), following a 35-year career with the FDA where she worked as Director of Programs and Enforcement Policy in the Office of Food Labeling in the Center for Food Safety and Applied Nutrition and as Acting Director of the Office of Food Labeling. Ms. Campbell played a key role in writing the Nutrition Labeling and Education Act (NLEA) regulations in the early 1990s, and then had major responsibility for implementing those regulations. II. Overview of the History of Food Labeling. IV. Changes in Food Labeling Regulations. C. Common or Usual Names for Nonstandardized Foods. F. Descriptive Claims: Fresh, Freshly Frozen, Fresh Frozen, Frozen Fresh. G. Other Noncertified Color Additives, and Spices and Flavorings. H. Food and Drug Administration Modernization Act (FDAMA) of 1997. V. Outline for Compliance Review. B. Determine the Completeness and Accuracy of the Required Label Information. C. Determine the Degree of Compliance with Applicable Regulations. D. Advise Responsible Firm of Label(s) Needing Corrections. VI. Compliance Label Review Program. C. Name and Place of Business. D. Net Quantity of Contents Statements. G. Special Labeling of Foods. VII. Labeling of Foods in Special Categories. VIII. Administrative Rules, Decisions and Special Labeling Requirements. A. Salt and Iodized Salt. B. Fresh, Freshly Frozen, Fresh Frozen, Frozen Fresh. IX. Exemptions from FDA Requirements for Foods. A. Procedures for Requesting Variations and Exemptions from Required Label Statements. B. Exemptions from Required Label Statements. C. Petitions Requesting Exemption from Preemption for State or Local Requirements. D. Exemptions When it is Technologically Impractical to Nutrition Label. E. Nutrition Labeling of Food: Exemptions/Special Labeling Provisions. F. Food: Exemption from Labeling. G. Temporary Exemption for Purposes of Conducting Authorizing Food Labeling Experiments. H. Temporary Permits for Interstate Shipment of Experimental Packs of Food Varying from the Requirements of Definitions and Standards of Identity. A. Failure to Reveal Material Facts. C. Food with a Label Declaration of Nutrients. D. Food Subject to Nutrition Labeling. E. Food: Prominence of Required Statements. G. Substantial Compliance of Food Retailers with the Guidelines for the Voluntary Nutrition Labeling of Raw Fruits, Vegetables, and Fish. C. Botanical and Other Novel Ingredients in Conventional Foods. XII. Charts, Illustrations, Statements, Regulations. XIII. Index to the January 6, 1993 Federal Register Preamble and Final NLEA Regulations. XIV. Index to the August 18, 1993 Federal Register Preamble: Nutrition Labeling Technical Amendments. XV. 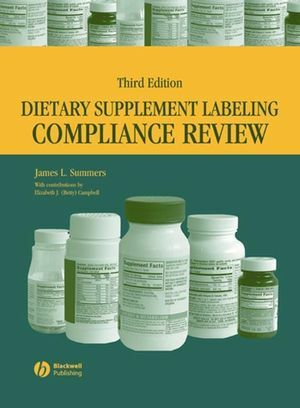 Table of Contents for Chapter 5 – Foods, Colors, and Cosmetics for the Compliance Policy Guide, DHHS, PHS, FDA, ORA, OF, DCP. XVI. Table of Contents for Food Labeling Questions and Answers for Guidance to Facilitate the Process of Developing or Revising Labels for Foods Other than Dietary Supplements, U.S. DHHS, PHS, FDA, August 1993. 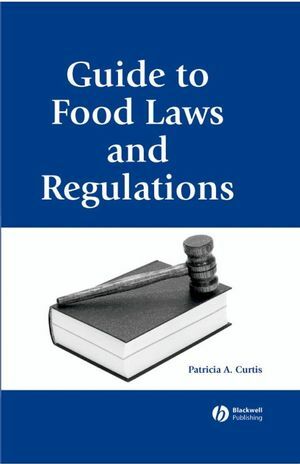 "Designed to aid in understanding the FDA food labelling regulations."